Since the days of King Cnut, few public figures can have had such an impossible relation with the sea. In the paintings of John Virtue the viewer finds themselves lost in the surf. But each work represents the most fleeting of moments, as waves break quicker than the hand can sketch. And this artist’s hand makes hundreds of sketches. One of the focal points of his new exhibition at Towner is a cabinet some four metres long in which the drawings pile up, open book upon open book upon open book. In many cases you can see the blots made by incoming rain clouds. That said, most of the works in the show are just as scaled-up as the cabinet. Three of the paintings here are almost six and a half metres long. All of the paintings are in black, white and a sparing grey. So many monumental works add up to a pretty overwhelming visual experience. Virtue cuts a neat and compact figure, quite far removed from the wild man you might imagine was behind these epic nature paintings. Over a mineral water in the Eastbourne gallery he tells me more about his Sisyphean process and paradoxical practice. The fleeting source material comes from the coast by his North Norfolk home. The artist lives near Blakeney Point, which, he tells me, is “very isolated, very bleak, very stormy in winter”. Once a week he walks the four and a quarter miles to and from the Point and will make hundreds of sketches. But no matter how fast an experienced hand can draw, the sea is strangely cruel to artists. Virtue points out: “It changes faster than you speak. It changes all the time, not just from day to day but from second to second.” But the philosophical painter is quite content with this. “It’s that quality of nothing and everything that’s so enthralling. It’s mesmeric,” he says. The elusive forms he calls a “perfect armature for developing all kinds of ideas, abstract ideas”. And indeed, if a hypothetical focus group saw these works out of the blue, they might conclude them to be abstract. So, these wave studies are at the limits of figuration. “How can you do something topographical when you have people like Turner and Constable? That is a tradition that you have to work against,” he says. Landscape appears to be an alibi for Virtue rather than a rigid category. At the same time he rejects the label of abstraction. “I’m not able to make it up,” he insists. “It just would not work, if I don’t have the compost, if I don’t have the drawings.” When asked about those heroic Ab Ex painters from the 20th century, Virtue points out they were often inspired by real world forms. “I admire Pollock very much” says the artist, suggesting that between 1948 and 1950 the maverick US painter was working in a tradition of nature paintings. De Kooning, likewise, had a period during which he painted the landscapes near his Long Island home. But subject matter apart, Virtue is also very drawn to the physicality of painters like these, and Franz Kline. “They seemed to be using the whole of their bodies on a great big scale, twice their body size,” he says, “And that can be used in what I’m doing because I work on a pretty big scale”. Another influence on these monochromatic paintings is, perhaps unsurprisingly, zen calligraphy. Virtue has been drawn to this art form since early childhood, and remains fascinated by the difference between the tradition of the Western gaze and that of the Eastern glance. “It’s about mobility,” he explains. “So I’m walking and drawing in a very high speed way. And yet I’m trying to make concrete the utterly ethereal, and I sense that in Zen calligraphy that’s exactly what they’re doing. Virtue marvels at the ability to make a single mark with up to nine changes of tone. So perhaps walking long distances and making hundreds of rapid sketches demand more from one than simply choosing a shutter speed. Virtue is trying to capture a peripatetic event just as much as those individual waves. ”The ideas that are thrown up are extremely difficult to grasp,” he says, “Let alone convey them to an imaginary audience”. 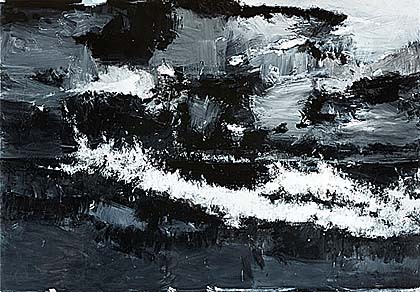 And yet you have to say, as you plunge into this roiling show on the South Coast, John Virtue has got control of the waters and could, you imagine, if he wanted, turn back that tide. John Virtue: The Sea is at Towner Gallery, Eastbourne until April 11 2015. Interview written for Culture24.